Kelsey Kelly, animal science senior, uses a stethoscope to listen to colt Gatsby's internal organs, as part of good husbandry of the horse. When the students head out to pasture to feed the horses, they also take note of their health and report any problems. Kelsey Kelly, animal sciences senior, cleans the hooves of Val, a female quarter horse. When the … Expand ▸Kelsey Kelly, animal sciences senior, cleans the hooves of Val, a female quarter horse. When the students head out to pasture to feed the horses, they also take note of their health and report any problems. The MU Equine Teaching Facility at South Farm currently houses a quarter horse breeding program with care and management of these horses being the cornerstone of these courses. Students help out with care of the horses as a learning experience. CAFNR Animal Sciences, known for its beef operations, also houses a strong Equine Science program. Almost 250 students and volunteers — about 20 percent of MU animal sciences students — are involved each year. Most are from urban areas and have little or no previous equine experience. They learn the trade to go into the equine industry. Two years ago, the equine operation increased its hoof print when the Sorenson family donated their working farm to Mizzou — a farm that included an established equine area. Now, students get hands-on experience at both the 45-acre equine operation at South Farm Research Center and the 15-acre Sorenson property just minutes away. Marion Wesley Sorenson was born in 1926 in Salt Lake City. He joined the Army after high school and was stationed in Germany. While on leave in Switzerland he met his future wife, Simone Rachel Chatelanat. They married in 1948. Sorenson earned his undergraduate degree at the University of Utah and later received his Ph.D. at the University of Missouri. He stayed in Columbia as a professor and researcher of zoology at Mizzou for 17 years. In 2012 they donated the family farm just east of Columbia to Mizzou. The gift included a home and outbuildings on the property. The property is adjacent to MU’s South Farm Research Center off New Haven Road and managed by the College of Agriculture, Food and Natural Resources. Rebecca Cooper, veterinary medicine student, works with Georgia, a young colt. The Sorenson equine area consists of three pastures, a barn with five stalls and an indoor riding arena. Marci Crosby, instructor and who leads the equine program, hopes to attract funding for additional pastures. The rest of the 400-acre property is used by CAFNR’s beef and fish and wildlife programs. The Sorenson family designed this part of property specifically as an equine operation. Each stallion involved in the breeding program there has its own private pasture. Sorenson is a private and gated operation, which keeps the public from dropping in to feed and pet the stallions who can be unpredictable and sometimes aggressive. The Sorenson site also has a quarantine area to receive new horses. The land addition will help in other ways. It will also support the breeding program which culminates each year in a student run horse auction and fundraiser, an event that provides an income stream to the program and gives students practical experience in breeding, marketing and working with clients. Students have two academic options. 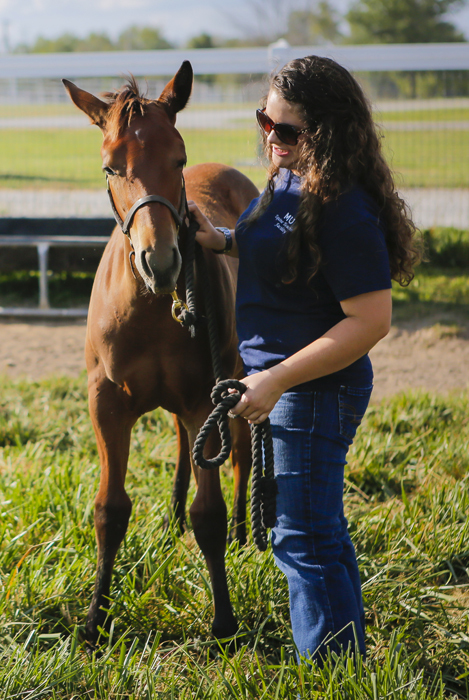 The first is an undergraduate degree in Animal Sciences with Equine Emphasis. The second involves a partnership with Stephens College where students can take riding- and showing-based equestrian courses as general electives. Students who chose the Equine Emphasis route find careers in management and agricultural sales roles. Many move into veterinary medicine. Crosby said that 20 percent of CAFNR’s Animal Sciences students are in the equine track. Many graduates stay in Missouri as it is an important equine state. The American Horse Council states that 125,000 Missourians are directly involved in the industry as horse owners, service providers or employees. That’s about one in 50 employed people in the state, said Crosby, making it one of the state’s biggest recreational areas. There are 281,000 horses in Missouri, more than 70 percent are involved in showing and recreation. The Missouri horse industry produces goods and services valued at $718 million. Kelsey Kelly, animal sciences senior, uses a stethoscope to listen to colt Gatsby’s internal … Expand ▸Kelsey Kelly, animal sciences senior, uses a stethoscope to listen to colt Gatsby’s internal organs, as part of good husbandry of the horse. When the students head out to pasture to feed the horses, they also take note of their health and report any problems.